Philip N. Hammersley is a Shareholder and a member of our trial practice and dispute resolution group. He practices primarily in the areas of complex construction, commercial and residential real property litigation as well as trust and property disputes. He is also a Florida Supreme Court Certified Mediator. A 1975 graduate of the University of Florida, he earned a Bachelor of Science in Business Administration, with a major in Economics. He received his Juris Doctor Degree from the University of Florida College of Law in 1978.Mr. Hammersley has handled a multitude of varied construction, commercial and real estate litigation and arbitration matters through mediation, trial and appeal. He represents contractors, subcontractors, materialmen, design professionals, owners, developers, landlords, tenants, lenders, trustees, personal representatives and beneficiaries in all phases of dispute resolution. These matters have involved commercial disputes, condominiums, multi-unit, single family residences, and many areas of real property law.Mr. Hammersley is admitted to practice in all Florida state courts, the United States federal courts for the Southern and Middle Districts of Florida, the United States Court of Appeals, Eleventh Circuit and the United States Supreme Court.Mr. Hammersley has had an AV Rating* from Martindale-Hubbell for over 20 years, which is the highest peer-review rating attainable. 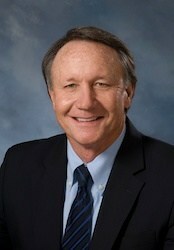 He has served on the Florida Bar Committee on the Code and Rules of Evidence, and has also served the Sarasota County Bar Association in various capacities, including Director of the Young Lawyers’ Section (1983 and 1984); Treasurer (1995 and 1996) and President of the Sarasota County Bar Association for the 1999-2000 year. He has served as a member on the Board of numerous non-profit organizations, including the YMCA Children & Youth Services Board, the Argus Foundation, and the Education Foundation of Sarasota County.